After three years of talking about this stuff I don’t think there is much to add upon the passing of this year’s third Thursday in November. My past bits can be found here. Anyone have any tasting notes they care to report for the 2010 vintage? I know I run the risk of devolving into a repetitive bore since I have commented on this subject before, but it just dawned on me that the 19th is the third Thursday of the month. 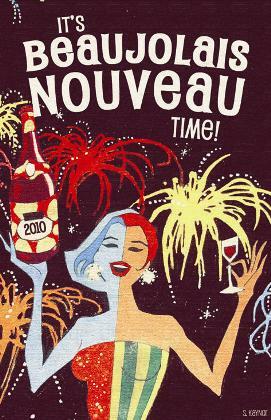 Yes that means Beaujolais Nouveau time is upon us again. Honestly I’m not sure I’m even going to buy a bottle. I feel the pull of tradition versus the memories of disappointments past. Besides I’ve already got my Thanksgiving bottles picked out. I’ve got 10 bottles for eight adults so I should be covered. If not we can always raid the cellar. What do you think? Any BN in your future? Long time readers will know my feelings on Beaujolais Nouveau. Its just something I feel compelled to try each year. I had kind of resolved that I was going to avoid the BN this year and try some of the better versions of Beaujolais out there. However as I was waiting to purchase some other stuff at Ye Old Spirit Shop (Shoppe?) on 7th Street the colorful label from Geaorges Duboeuf had caught my eye and before I knew what had happened there was another $10.99 on my tab. Thanksgiving is certainly tied for first as the best holiday of the year for me: a day devoted to food, drink and family. What could be better? We decided that the only way to make it better is to have a pre-Thanksgiving dinner on Sunday for those who are scattering on the actual holiday. In reviewing the wine I decided that it would be a good time to break out the BN. Actually Beaujolais is a very good choice for a wine that can pair with the profusion of dishes found on the Thanksgiving table. As someone once said: Beaujolais is the only white wine that is actually red. I think this is because Beajolais is often very acidic and food friendly and drinks better slightly chilled. With that in mind I sat the bottle out on the back deck for an hour or so before opening. When we cracked it the first thing you noticed is the powerful candy fruit on the nose. It had a huge nose of strawberry laffy taffy or twizzlers (what I call a fake fruit nose). However, it was much more subtle on the palate. Mild flavors of strawberry and raspberry, with lots of acidity and a longer than expected finish made this a good wine. As a bonus it paired well with all of the dishes we served. While there probably won’t be anyone who falls in love with this wine, there probably won’t be anyone who hates it either, so its a smart choice for the Thanksgiving table. Mrs F and I both agreed that this was the best BN we have had in a long time. At $10.99 its not a bad price and I give it a solid 87.
from, of course, the Frederick County Public Library. The first half of the book is a semi-dry, but interesting to a wine geek, read about the history of the Beaujolais region and the Gamay grape. It traces wine growing in the region from Roman times forward. The second part is an easier and more interesting read as it focuses on George Duboeuf and the rise of Beaujolais. It details how from very humble beginnings he used his work ethic and marketing savvy (he was the first person in France to use something other than a plain label on his wines) to build a business empire and promote the wines of the region, especailly Beaujolais Nouveau. All in all a fun read. One of the things the book inspired me to do is to try some more Beaujolais besides just Beaujolais Nouveau. I was aware that some of the non BN wines, especially the Beaujolais-Villages and Beaujolais Cru appellations can make outstanding wines, but I have not had a chance to try many. I’m going to try to rectify that situation and will report back to you. Interestingly enough M. DuBoeuf struck a deal with the French government to allow an early release of his wine this year so that he could use ships to haul about 75 percent of his 2 million U.S.-bound bottles, instead of the usual one-third by boat, two-thirds by air. Some other producers are also shipping their BN in plastic containers as well this year. This was ostensibly done to make BN more “green” but cynics have pointed out that this is a way to cut costs to offset the Dollar’s decline against the Euro and try and keep the price of BN the same. As the book indicated he is a terrific businessman. Do you ever have one of those almost automatic, mindless family traditions that you do every year? You may even look forward to it, but when you are doing it you wonder why the hell you do it? Well Beaujolais Nouveau is like that for me. I don’t know why I drink it, but every November I feel compelled to buy a bottle. 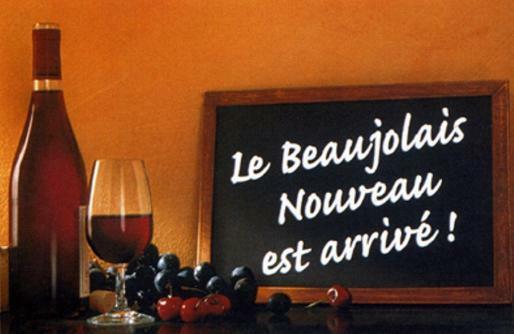 Must be the marketing genius of George Duboeuf: the undisputed emperor of Beaujolais Nouveau. (It is reported he produces a cool 7 million bottles of BN each year). For those of you that don’t know BN is produced in the Beaujolais region of France from the gamay grape. It is bottled in the same year it is harvested and available worldwide on the third Thursday in November. Unlike most other reds, and perhaps as a testament to its low quality, it is best served slightly cool. I usually set it out on the back deck for a few hours. So with low expectations here it is: (Purchased from Ye Old Spirit Shoppe for $ 12.98) This is a widely available wine. 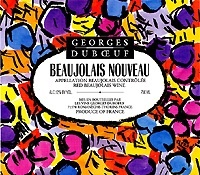 2007 Georges Duboeuf Beaujolais Nouveau: Strong nose of strawberry laffy taffy mixed with cider vinegar. Very thin on the palate with a hint of strawberry. Quick acidic finish. Was a tolerable quaffer with spaghetti and meatballs. 82 points. Let me know what you think, Fred.